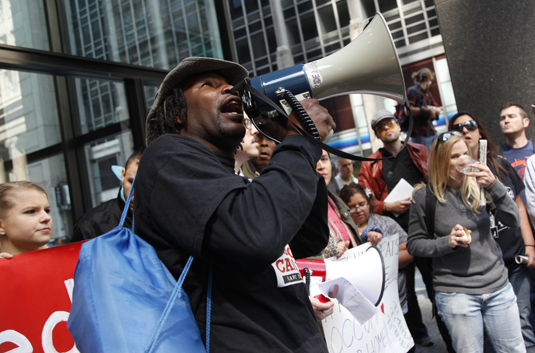 J.R. Fleming leads the chants to start the march Wednesday on Jackson and LaSalle streets. A protester holds a sign representing the new organization "Communities United Against Foreclosures and Evictions," that was formed from several different housing organizations across the city. Brian Bean leads the march Wednesday down LaSalle Street heading towards Citibank. Simon Swartzman carries on the chant while the protest heads over to Daley Plaza. Employees at the AT&T store on LaSalle Street take photos of the group of protesters heading towards Citibank on LaSalle. Matthew McLoughlin tries to talk a police captain into letting demonstrators leave the couch on the corner outside of Citibank. Occupy protesters carry a couch across Madison Avenue on the way to Daley Plaza. Protesters and media set up in front of Citibank on the second stop of the protest that ended at Daley Plaza. Occupy protesters carry a couch around the side of City Hall on the way to Daley Plaza. Protesters carry furniture to set up a home on a stage at Daley Plaza during the protest on home foreclosures and evictions. Occupy Chicago protesters set up a makeshift living room on a stage at Daley Plaza for a play. A protester takes a seat on the couch on the stage at Daley Plaza. A television sits on table on the stage set up at Daley Plaza. Police officers carry out a sofa that was left in the lobby of the Citibank across from Daley Plaza. Police officers try to load a chair into the back of a police vehicle outside of Citibank.